The Issaquah Meal program is supported by over 25 dedicated volunteer groups from local faith communities, businesses and community groups who prepare and serve evening meals Monday through Friday. Each night there are also volunteer leaders on site to oversee operations and support the volunteer groups. The program has been fortunate to have several volunteer leaders who are present nightly in this role. Their commitment has been instrumental in contributing to the sustainability of the Issaquah Meals program. Sylvia Mason is one of the first people diners meet when coming through the doors for dinner. She greets first-time diners with a welcoming smile and returning diners by name. 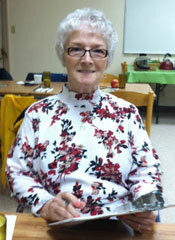 In June, Sylvia will mark the 10-year anniversary of her involvement with the Meals program. She takes a meal count each night of people using the program, provides training for volunteer groups, helps to maintain a welcoming and safe environment, and oversees nightly clean up procedures. Sylvia became familiar with the program when she was working and living on a tight budget. She attended the Issaquah Meals as a diner to supplement her budget. When a volunteer leader passed away, Sylvia offered to become a part of the CCS volunteer leadership group. She will be retiring in June to “spend more time at home with the grandchildren.” When asked what her favorite part about volunteering with this program is, Sylvia is quick to say “meeting all of the volunteer groups, and all of the people I normally would not ever meet or get to know.” It has been an honor and a joy to work with Sylvia over the years and we are tremendously grateful for her service to our program and the Issaquah community. Thank you, Sylvia!! Issaquah Meals brings supper to the hungry, five nights a week in Issaquah, and at Avondale Park in Redmond monthly on the third Wednesday during the summer and bi-monthly during the rest of the year. For twenty years, the Issaquah Meals program has served this community, providing nightly meals M-F at 5:30 p.m. for individuals of all ages. The program is a no questions asked service. Community groups comprised of volunteers from local faith communities, schools, families and friends rotate each night serving the meal at the Community Hall, located between the Police and Fire Stations in Issaquah. Monday – Friday 5:00 p.m.